Sarry talks about learning the role of Swanilda in Coppelia and crafting a "flashy" ending for her final performance of the Aurora Variation. Sarry got her start in the ballet world when she was scouted by the Joffrey Ballet in high school. From there, she joined the compamy of the American Ballet Theater, where she first played Lizzie Borden in Agnes de Mille's revival of Fall River Legend. Making the controversial decision to leave ABT for Eliot Feld's company in 1974, Sarry enjoyed a more contemporary and forward-thinking approach to choreography and performance. Sarry became a teacher at Ballet Tech, New York City's Public School for dance, and became it's Director of Ballet Faculty in 2003. 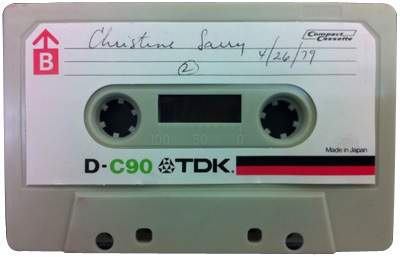 “Christine Sarry (published 1992),” Dance Dialogues: Interviews by Barbara Newman, 1979-Present, accessed April 25, 2019, http://dancedialogues.prattsils.org/items/show/43.